Nu Skin has launched new products that further expand its lines of anti-aging and holistic beauty products. These are expected to uphold the brand’s commitment to empower people through improvement of lives, rewarding of business opportunities, introduction of innovative products, and enrichment/uplifting of culture. For those who are looking for direct selling as business opportunities, there is another promising option. You can be part of the direct marketing program of Nu Skin, one of the world’s leading direct selling companies. The company is starting to strengthen its presence and force in the Philippine market. Nu Skin aims to help its distributors earn greater income through commission from sales. Its employees and distributors passionately uphold the highest standards of entrepreneurship, professionalism, and integrity. To date, it has about a million active independent distributors around the world. You could be among those. To date, Nu Skin is selling over 200 products in the anti-aging, personal care, and nutritional supplement categories---ageLOC (targeting aging signs and sources), Nu Skin key products (ageLOC Transformation system, ageLOC Edition Galvanic Spa System II, ageLOC Galvanic Body Spa, and the Tru Face line), and Pharmanex products. You can be a part of its growing team, with its several direct sellers strategically scattered across the country. Nu Skin’s firming specialist, ageLOC® Tru Face® Essence Ultra battles sagging facial skin and helps contour your features—defining skin around the eyes, neck, chin, and jawline. With its key ingredients including Ethocyn®, clinically proven to improve the key component of firm skin, and an antioxidant network which helps protect the skin from free radicals, the product is also the latest installment in Nu Skin’s revolutionary ageLOC line and contains an ageLOC proprietary blend which targets the sources of aging that lead to the loss of firmness. A breakthrough weight management and body shaping system, ageLOC® TR90™ is based on highly innovative gene expression science, that unifies your mind and body—for a leaner, younger looking you. Combining powerful supplements, a simple eating plan, and a more active lifestyle, ageLOC TR90 guides you on the path toward a leaner, healthier, happier life. With mind, body, and ageLOC working for you, you can succeed. At the core of the clinically proven system are the newest members of the “super class” of ageLOC products, designed to work in harmony with the ageLOC TR90 eating plan: JUMPSTART, the perfect push to get you primed and ready for success; COMPLEX, a great way to get your body back on track; CNTRL, which makes it easier to stay on the path to success; and TRIMSHAKE, which helps control calories and is a great source of the high-quality protein that your muscles need. It also helps reduce food cravings while helping you feel fuller longer by producing a feeling of satiety. ageLOC Tru Face Essence Ultra and ageLOC TR90 were developed utilizing Nu Skin’s proprietary science that enables the company to identify unique groups of genes specific to the aging process, called Youth Gene Clusters (YGC), and then target and reset them to more youthful patterns of activity. Dubbed as ageLOC® science, this proprietary technology is drawn from more than thirty years of exclusive anti-aging research, and was created by over 75 of Nu Skin’s in-house scientists. 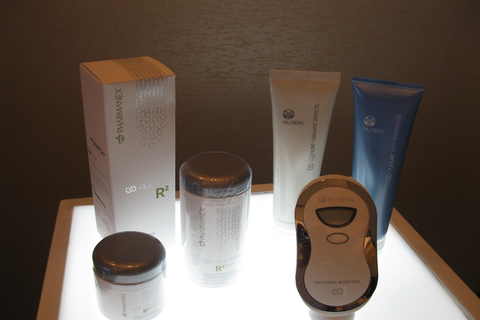 Previous products born out of this unique gene-based innovation include ageLOC® R², the ageLOC Galvanic Body Trio, the ageLOC Galvanic Spa System II™ and Gels for the face, and the Nu Skin ageLOC® Transformation daily skin care system. The ageLOC® line has proven to be a tremendous success for Nu Skin, surging past $3 Billion in sales over the past four years, since the first ageLOC® product was launched in 2010. 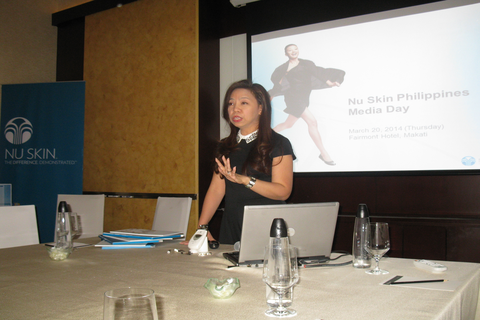 Photo shows Nu Skin Marketing and Communications manager Rose Castillon as she welcomes guests to the launch event. For more details on ageLOC and Nu Skin, please contact Ren dela Cruz, Corporate Communications Manager-Associate of Nu Skin Enterprises Philippines, Inc at telephone number +632-6261927 or mobile number +63927 2130460.